“It's HEAVEN when you marry a good man”, says Anushka Sharma as she takes us back to her intimate Italy Wedding with Virat! 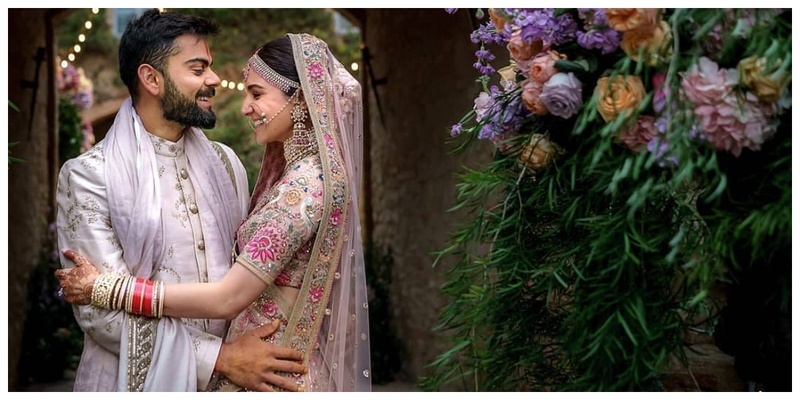 My favorite couple - #virushka have completed one year to their dreamy Tuscany wedding and have taken to their social media to share some unseen pictures from the ceremony and beyond doubt they are b-e-a-u-t-i-f-u-l!! Here’s saying I’am literally shedding happy tears! Anushka Sharma went a step ahead in making the occasion more awesome by sharing a beautiful video of their wedding which has snippets from their Jaimala ceremony, the moment where Virat applied sindoor on her forehead, while he fixes her drape, them holding hands in the mandap, taking pheras and the moment where he is so overjoyed to call Anushka his 'wife'! P.S., don’t you miss the moment where he takes Anushka’s permission before he puts the varmala to Anushka! Drawn by the idea of having an intimate wedding with just immediate family and close friends, away from the hustle and bustle of Mumbai life, Anushka and Virat decided to get hitched in Italy's Tuscany on December 11 last year. Anushka and Virat are currently in Australia, ringing in their one year of marriage and a lifetime of togetherness. Here's wishing this couple a happiest wedding anniversary and may they keep giving us #RelationshipGoals all the time!